Because we’re introducing you to the new and wonderful world of Left Field Cards, perhaps the world’s strangest pack of baseball cards, available now. Well, strange in the sense that they’re not your standard-size cards. They’re more postcard-size... because that, in fact, is what they are. Each player’s image has been hand-carved from a block of wood, then pressed on a postcard that’s suitable for framing or mailing. 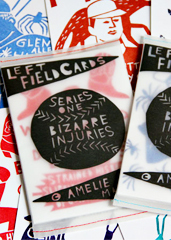 The first series is called “The Bizarre Injuries Series,” a collection of players who managed to hurt themselves off the field in strange and/or amusing ways. John Smoltz scalded himself while ironing a shirt... that he was wearing. Nolan Ryan was once bitten by a coyote. And, of course, Glenallen Hill fell down the stairs during a violent dream about spiders. You know, that kind of stuff. Fingers crossed for Bill Buckner.